This book was a passion felt work of art.. I enjoyed the flow of the story, and the journey of Jacob’s life. the heart-break and love he went through was very moving.. Jacob is a great character in this book, he has a good heart, pride, and confidence. John Neeleman is such an amazing writer, this novel held me captive with the writers emotional felt words. This book is wrote with both religious and philosophical, and it has also historical events, this book keeps your interest held, this was such a wonderful book! Logos gave me perspective. made me really think of church and faith. Logos, my view or what I felt from Jacob’s tragedy that he faced, Jacob found his way to forgiveness and he releases that weight of being wronged that he’s been carrying for so many years.. Plus a deeper understanding what choosing to have your own beliefs cost so very many people, but they stilled held strong to their belief no matter what.. After reading this, I felt more comfortable in my faith. I know that some might read this book, and not like it for their own beliefs, but that shows us how much we’ve grown in this world, we can choice to have our belief’s and no one can say that we can not!! Finally I add, this book is great fictional read, I like that the writer did research on the historical events, but made the book his.. I recommend this to any and all that would enjoy a great fiction religion book, this is my second an I just loved reading it so very much!! Recommended for all 18 and older!! This is such a emotional raw book, that will set every nerve ending on high alert!! When you start this book, best to go knowing nothing at all!! As you read it you read you will discover different layers upon layers, as you peel them back you will start to feel so may emotions, as you go farther into this book it only gets better and better!! At some points I was holding my breath for what’s going to happen next!! When I first started this book, I was so happy with the pace and the raw naked emotions you feel as this story unfolds.. Sloth is one very strong-willed person, and does all to survive with the cards that have been dealt!! That’s all of Sloth I’ll give!! This story is one that hit every emotion so hard that I cried some fat gross tears!! That just emphasizes how totally wonderful this book actually is!! This book connects with me on a deep level, it’s hard to explain, no spoilers!! All I’ll say is to know deep sadness and find your way through it, reading this book made me embrace what happened!! 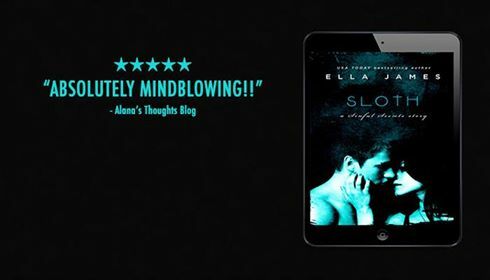 For that I Thank you Ella James for a very talented and creative book Sloth, that I loved and enjoyed so very much!! I also want to recommend this to all the loves a great book that has so many demission that you can’t say just one like its romance, mystery, drama and others too. For all 18 and older!! We have a fantastic announcement from Nichole Chase today, and we cannot wait to share it with you! Are you ready? Fans of Nichole Chase’s Royal Series, get ready to cheer! The American Royalty Series is coming!!! HarperCollins will be publishing Nichole’s new series The American Royalty Series in Winter 2016, and you are NOT going to want to miss what Nichole has up her sleeve! West Wing meets Scandal meets Suddenly Royal Mashup, anyone? The TET is far enough away from Earth that the crew goes into suspended animation for the initial travel to it. This initial travel is either automated or controlled from Earth. After waking up, the crew speak conversationally with their mission controller Sally. This conversation between Jack, Vika, and [actual human] Sally happens over a small 2d video communication system. The panel in the middle of the Odyssey’s control panel shows Sally and a small section of Mission Control, presumably back on Earth. Sally confirms with Jack that the readings Earth is getting from the Odyssey remotely are what is actually happening on site. Soon after, mission control is able to respond immediately to Jack’s initial OMS burn and let him know that he is over-stressing the ship trying to escape the TET. Jack is then able to make adjustments (cut thrust) before the stress damages the Odyssey.